On June 20, Instagram made two big announcements: the first announcement was that the app had reached a milestone of one billion users (a huge achievement considering the platform was launched as a simple photo-sharing app less than a decade ago). And the second, far more important announcement was the unveiling of IGTV (abbreviation of Instagram TV), a new complementary app/feature for watching long-form, vertical videos on Instagram. Are you curious to learn more about this groundbreaking new feature from Instagram and its marketing implications? Then this article is for you! 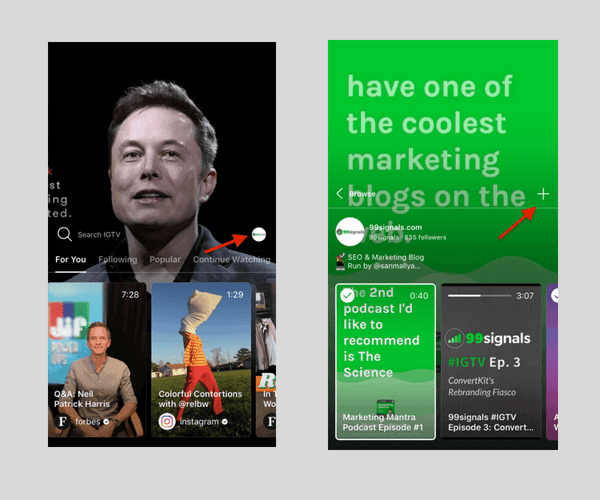 In this article, you’ll discover the true business potential of Instagram IGTV as we cover IGTV from a marketing perspective and reveal a few tips that you can use to make your IGTV videos stand out. Too busy to read this article? Just click the play button below to listen to the podcast episode where I discuss IGTV in detail. You need to upload videos that are longer than 15 seconds. The videos have to be vertical and full screen. You can upload videos from both mobile and desktop. IGTV seems like a logical next step for a platform that has been experimenting with videos for the last five years. You can access IGTV on your Instagram app itself or download the standalone app from the App Store or Google Play Store. IGTV starts playing videos as soon as you open the app. 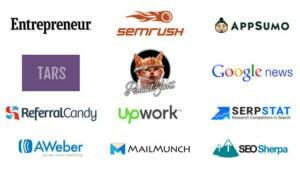 You don’t have to search or browse to get started. Just like your TV, IGTV has channels. The people you follow on Instagram are the channels. Most importantly, anyone can start their own IGTV channel and start uploading videos. Continue reading to find out how to create your own IGTV channel and upload videos. You can create your IGTV channel via a mobile device or desktop. To create your IGTV channel on your mobile device, open the Instagram app and tap the IGTV icon in the top right corner of your feed. Next, tap on your profile picture and then select the ‘Create Channel’ option from the pop-up menu. Follow the on-screen instructions to set up your IGTV channel. To create your IGTV channel on desktop, visit Instagram.com on your web browser and login to your account. Go to your profile and click on the IGTV tab at the top of your feed. Select ‘Create Channel’ option and follow on-screen instructions to set up your IGTV channel. A feature that’s missing on IGTV mobile, but available on desktop is the ability to edit your videos. You can edit your IGTV titles and descriptions here, but for unknown reasons, this option is not yet available on the Instagram app. Now that you’ve created your IGTV channel, you can start uploading videos. Tap the + icon from here, select the video you’d like to upload, and then hit Next. Add a title and description to your video (optimization tips below) and then choose whether you’d like to share the video on your Facebook page. In the next section, I’ll reveal 7 tips and best practices you can follow while creating and uploading IGTV videos. It’s important to remember that IGTV is still at an early stage. So, brands, celebrities, and Instagram influencers are still trying to figure out how to use the new channel at their disposal. 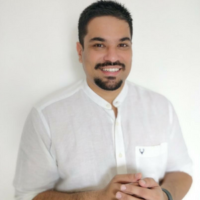 Instagram recommends business accounts use IGTV mainly as a storytelling medium and upload longer videos to build stronger connections with potential customers. As stated before, IGTV videos can be up to an hour long. So use that to your advantage while creating long-form vertical videos for your IGTV channel. In the meantime, here are a few tips and best practices you can follow to generate buzz for your IGTV videos. A common vexation among brands and influencers on Instagram has been the platform’s reluctance to allow clickable links in photo/video descriptions. Luckily, that’s not the case with IGTV as any URL listed in your video description is automatically clickable. 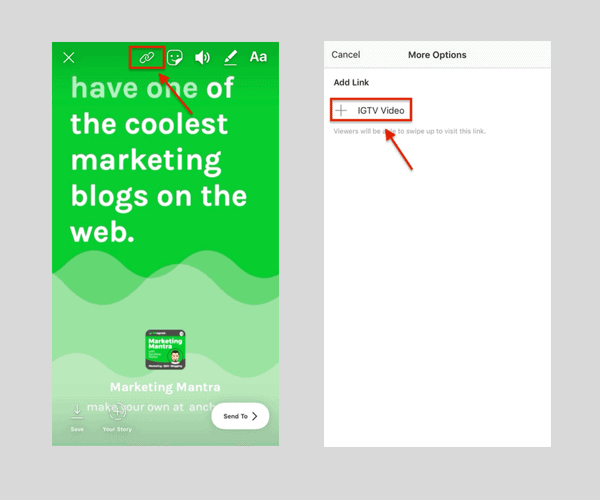 Marketers can leverage this feature by including CTAs and links in your IGTV video descriptions and start driving traffic to your website from Instagram. Hashtags are more popular on Instagram than on Twitter. On Twitter, the best practice is to include 1-2 hashtags with your tweet, but with Instagram, there’s no such thing as too many hashtags. 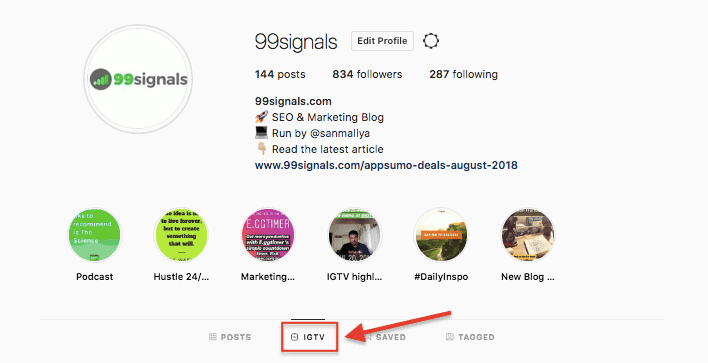 And you can include as many as 30 hashtags in your IGTV video descriptions to make them more accessible on the platform. If you’re worried that you’re going to clutter your description copy, then simply put your hashtags in the comments section. Your IGTV videos will still be searchable via these hashtags. Side note: To learn more about how to use hashtags on Instagram, check out this post on Instagram Hashtags by Foundr. Unless you’ve been creating long form vertical videos for a while, chances are that you wouldn’t have a depository of vertical videos to upload to your new IGTV channel. In that case, what do you do about your older videos that you uploaded on YouTube, Vimeo or Facebook? Is there a way you can upload some of them to your IGTV channel. The answer is yes. I recommend using a free app called SooMov (available on iOS) which lets you fit a horizontal video in vertical and blur backgrounds. Just be selective with such uploads on IGTV as the app mainly supports vertical videos created organically. There are plenty of video making tools out there which can help you quickly create high-quality text-overlay videos to upload to your IGTV channel. One of the tools I’d recommend is Rocketium which I’m currently using to create IGTV videos on the 99signals IGTV channel. Rocketium lets you quickly create videos with text overlay. You can create horizontal, square, and portrait videos at the same time for YouTube, Instagram and IGTV/Snapchat respectively with intelligent auto-sizing. Here are two videos I created for the same content using Rocketium – one for YouTube and the other one for IGTV and Facebook. So if you’d like to create similar videos for your IGTV channel, check out Rocketium. They’re currently providing a free trial to their service (no credit card required). You can upload a 15-second snippet of your IGTV video via Instagram Stories and then provide a link to your IGTV video. Or you could simply do a 15-second promo to your IGTV video and then provide a link to the video. Users will just have to swipe up to watch your IGTV video. This is a great way to generate awareness for the new video you just uploaded on your IGTV channel. The 15-second promos you just created for your videos via Instagram Stories can be saved as highlights and these highlights will be visible on top of your feed when someone visits your Instagram profile. As IGTV evolves, you’ll be creating lots of videos and these 15-second promos of your IGTV videos can help your new followers easily access your older videos. And depending on how interesting your promos are, they can decide whether they’d like to watch specific videos from your IGTV channel. 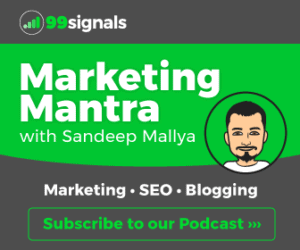 The golden rule of marketing is to analyze and improve each piece of content you create. Your IGTV videos are no exception. Instagram provides IGTV insights such as likes, comments, view count, and average percent of video watched. In addition to these insights, you can also view the audience retention graph for your videos, i.e. the percentage of views your video has received at each moment, shown as a percentage of all views. So keep monitoring your IGTV performance from time to time and make improvements accordingly. 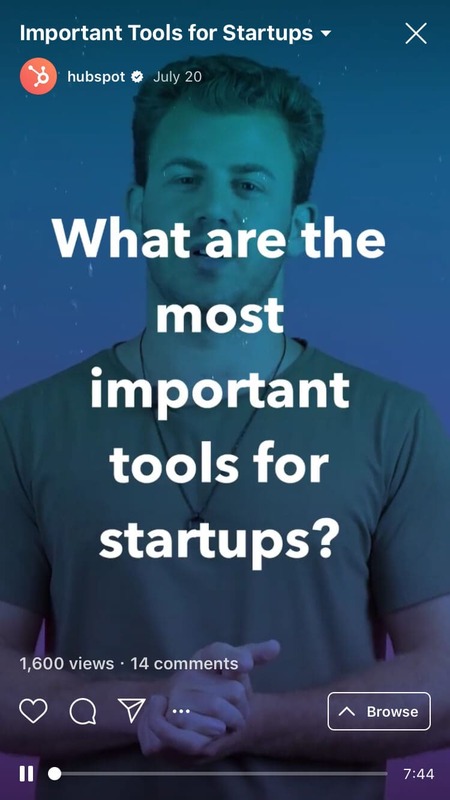 HubSpot recently published several IGTV videos where their team shares tips, tricks, and strategies small businesses can use to grow their business. 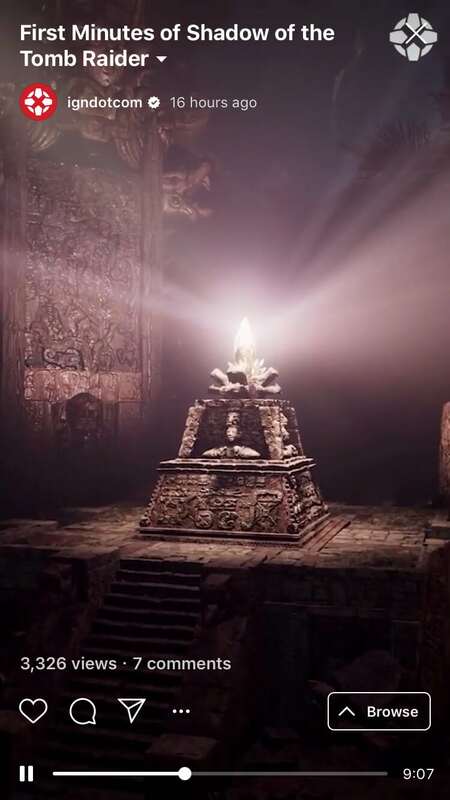 IGN published the first 15 minutes of the upcoming Tomb Raider game Shadow of the Tomb Raider on their IGTV channel. 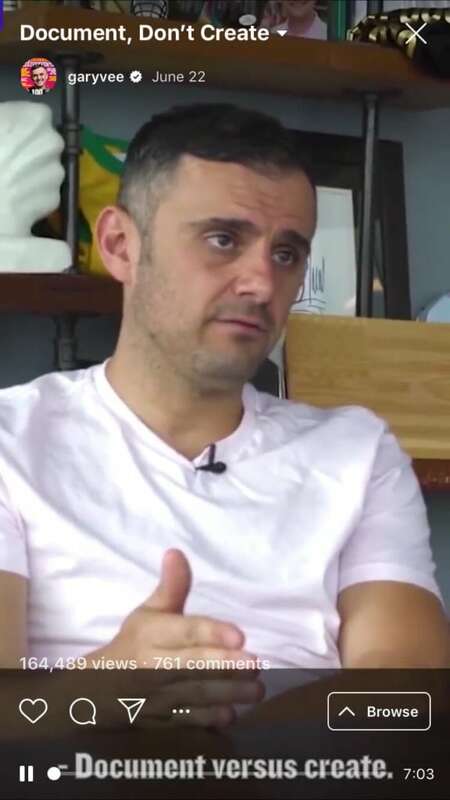 Gary Vaynerchuk (aka GaryVee) is known for creating native content for every social platform that he is in. In this IGTV video, GaryVee talks about the importance of documenting your entrepreneurial journey. While it’s too early to make predictions, IGTV may well be on its way to changing how we watch videos on mobile devices. It’s not going to replace streaming platforms like Netflix anytime soon, but it’ll surely compete with YouTube which has been the de facto go-to platform for video creators. What are your thoughts on IGTV? Are you going to create long-form video content on IGTV? Please share your thoughts in the comments below. Instagram is just getting the best and I love it.